You can also check that the DSK is recognized by going into the Device Manager and looking for "SD USB Based Debug Tools". You should see a "Spectrum Digital TMS320C6713 DSK" listed as a correctly installed device. If not, then CCS v5 has probably not been installed correctly. Now start CCS v5 by double-clicking on the desktop icon (or navigating through the start menu). You may be prompted to select a workspace. If so, choose a directory that you would like to use as your workspace and click "OK". 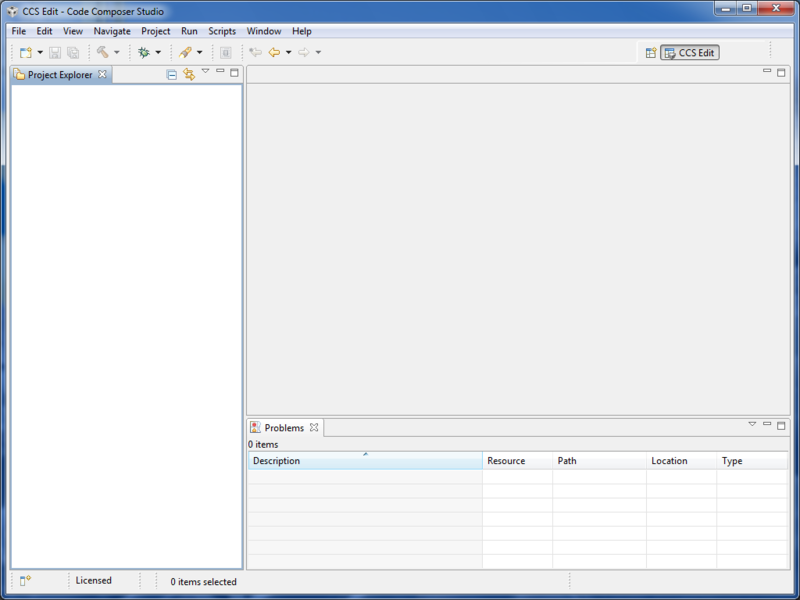 If the TI Resource Explorer window comes up, just close it. If a window comes up to activate/install a license file, you can select "Evaluate Code Composer Studio for 30 days" and click "OK". This is the "normal" edit view of CCS v5 where you will manage projects, build and debug your code, and interact with the DSK. Since this is the first time we are using CCS v5, we must set up a "target configuration" for the DSK6713. 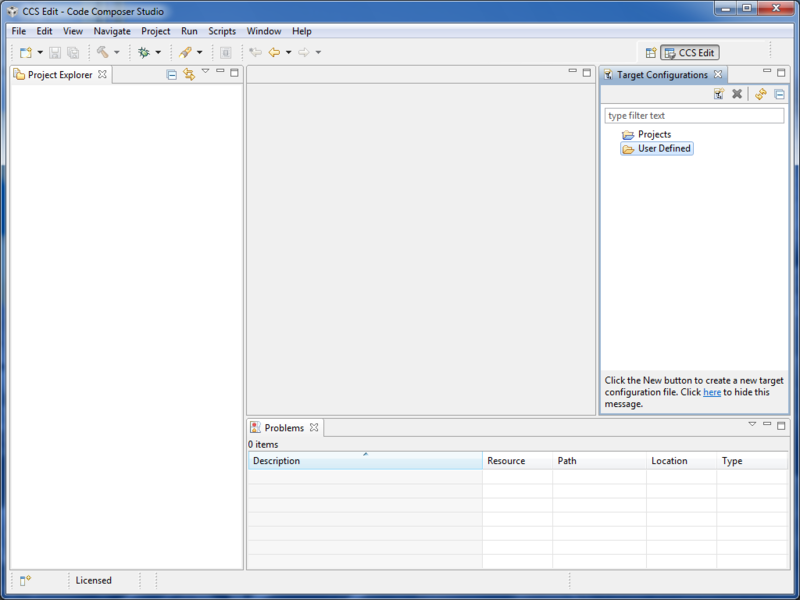 From the normal view of CCS v5, click on "Window->Show View->Target Configurations" to expose the target configurations panel. When you first use CCS v5, there won't be any target configurations. So we will set one up for the DSK6713. Note that you only need to do this once. You can name the new target configuration anything you want, but it is a good idea to pick something descriptive. 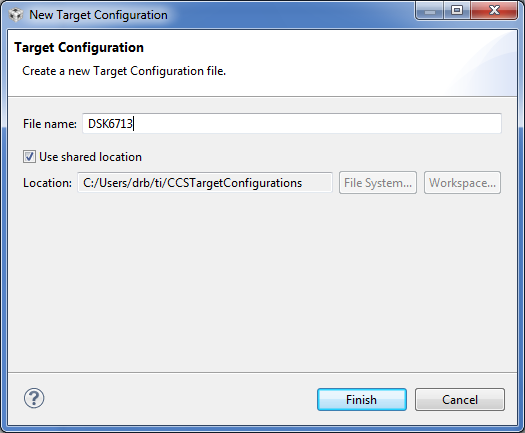 I've named the target configuration DSK6713.ccxml (the extension will be added automatically) and stored it in the default shared location. Click "Finish". A new panel should appear where you set some options for this DSK6713.ccxml target configuration. 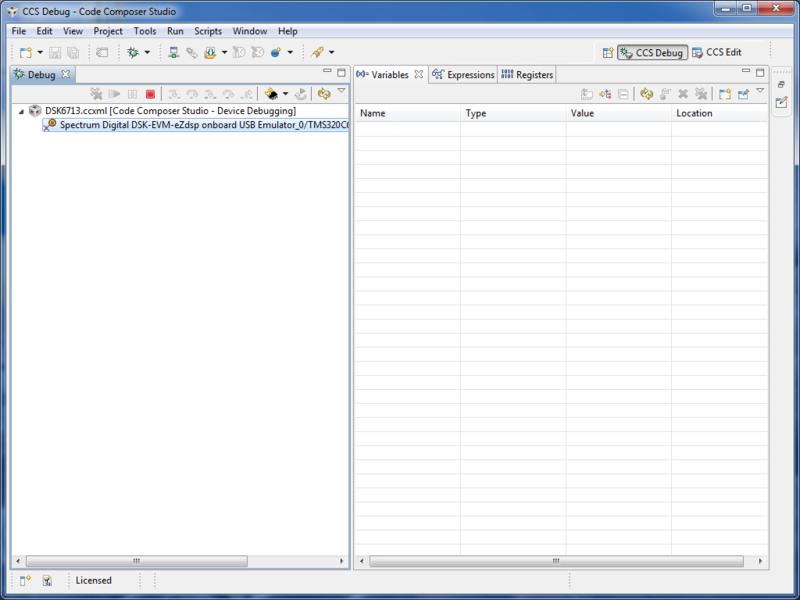 In the connection pulldown menu, select "Spectrum Digital DSK-EVM-eZdsp onboard USB Emulator". 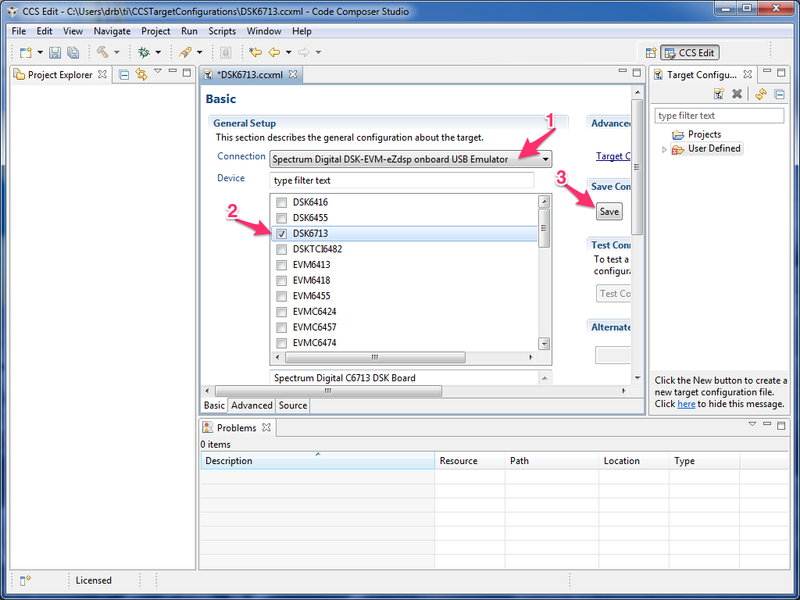 In the device selector, select "DSK6713"
Now expand the "User Defined" target configurations folder by clicking on the little triangle next to the folder. You should see the new DSK6713.ccxml target configuration in there. Right click on it and select "Launch Selected Configuration". You should see some USB enumeration as CCS v5 talks with the DSK and then you should see something like this window. If you get an error, then either CCS v5 wasn't installed correctly or you haven't set up the target configuration correctly. 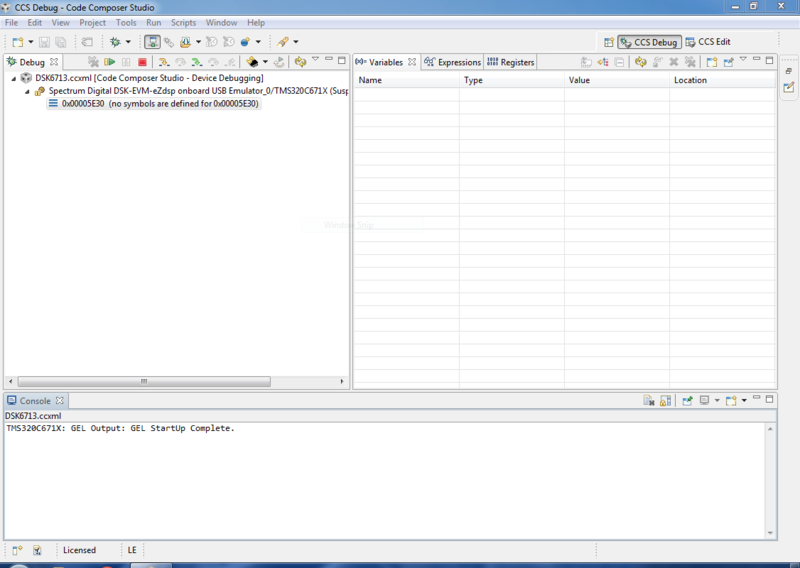 The message "GEL StartUp Complete" in the Console means that CCS v5 is successfully talking with the DSK. At this point, you now have a working development environment for the DSK6713. The next step is to write, build, and run a test program for the DSK.